Late afternoon on Monday president Sargsyan told a group of media representatives that until now he does not know “what demands Raffi Hovannisian is making by his hunger strike”. “If there is a concrete suggestion, I will give concrete answers. One cannot lead a dialogue alone. One cannot negotiate by himself… You have to have a partner. If your suggestions are not accepted you should listen to what suggestions are made to you rather than say ‘If Serzh Sargsyan is a man, he must resign.’ I can voice formulations, too,” said the incumbent president, explaining to the reporters that he had sent a document with suggestions to Hovannisian, but that “a cross was drawn on the document” and sent back. Hovannisian today welcomed the fact that Sargsyan had disclosed the “confidential document” and said that he will send his two suggestions – one about the resignation, the other related to a –pan-national complex alternative – after introducing those publicly on Friday during the rally. 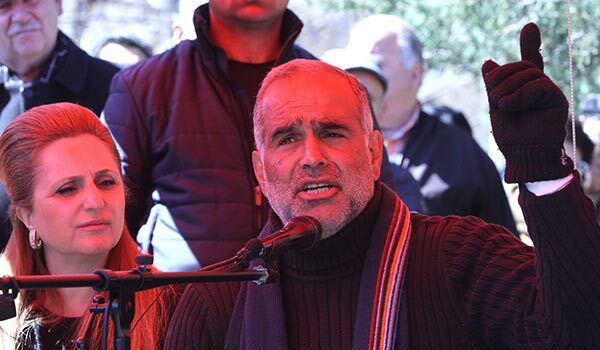 “Whatever happens after that and before April 9, will be open, transparent, so that people can witness; even if there is a meeting it will be open for the press, or will at least be live broadcast,” said Hovannisian, on his 10th day of hunger strike at Liberty Square. Speaking about the document Sargsyan made a reference to, Hovannisian said, in a closed envelope [with an inscription “National Assembly”] it was handed to Heritage party representative Armen Martirosyan by parliament speaker Hovik Abrahamyan. He stressed that to him that document is “a mockery and a crumb”, and that he put an X-sign on the document pages, and in no way a cross “because the cross is a holy symbol”. “See, it was March 16 and the document was dated March 5 – a memorandum signed by the National Assembly to be signed between Sargsyan and Hovannisian and refering to the idea of creating some kind of constitutional commission, council, and preparing a referendum in some 2-3 years. It’s a mockery, a crumb by its substance, but the bigger irony is in the fact that this is the option Abrahamyan had suggested during the non-official discussions and was rejected by our faction leader Ruben Hakobyan,” Hovannisian told the press. He also responded quite thoroughly to Sargsyan’s statements, in particular, he stressed he feels neither hunger, nor bitterness with the world, as the incumbent president claimed. Sargsyan also said he disagreed with Hovannisian’s claims that “the people are at the square” and pointed out that only some 3,000 people go to the rallies. “I believe it’s not worth descending to be among those 3,000. What is Sargsyan saying by that? If we rally 100,000 people, he would go to the trouble to come to negotiate or come and visit? Is that it? He wants us to prove to him that we can rally a hundred thousand people at this square to impress him? Is that what he is saying? I hope not, because the victory of the Armenian people has besieged Baghramyan 26 [presidential residence] and Mr. Sargsyan,” said Hovannisian.